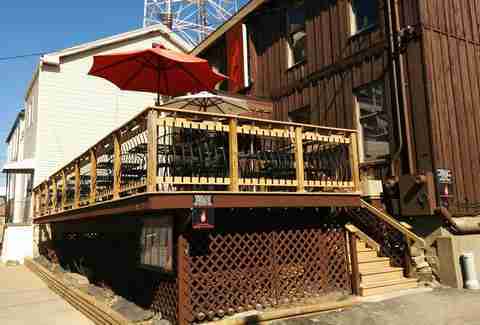 Make the most of those rare sunny Pittsburgh days with these outdoor spots for dining and drinking, all within the city limits. From rooftop lounges to patios to garden retreats, these 11 venues are in high demand during summertime. Oh, and most of them have umbrellas or covered spaces too, just in case it rains or you’re part albino. Dining on the open-air deck at Redfin Blues -- on an island in the Allegheny River -- is similar to dining at the beach, so what if the river water isn’t exactly blue? 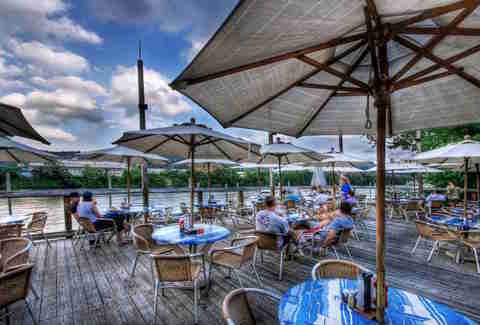 Tables on the riverside deck offer both a skyline view and a good look at the boats cruising along the river or docking at Washington’s Landing Marina. Plenty of seafood is on the menu, along with drinks. There’s a high-percentage chance you will want to buy a boat after a day spent on the Redfin deck. Spending an evening on the Pusadee’s Garden patio, shaded with vines and covered with plants, is like dining inside a beautiful greenhouse. Among the lush plants in the garden are herbs, which the chef picks fresh for use in the restaurant’s Thai cuisine. The restaurant is BYOB, so bring some white wine to pair with the spicy dishes. 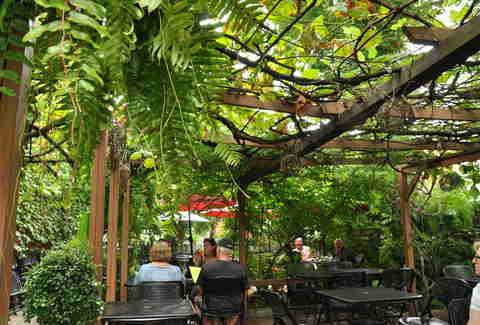 Be sure to make a reservation; tables at Pusadee’s Garden are in high demand on hot summer nights. 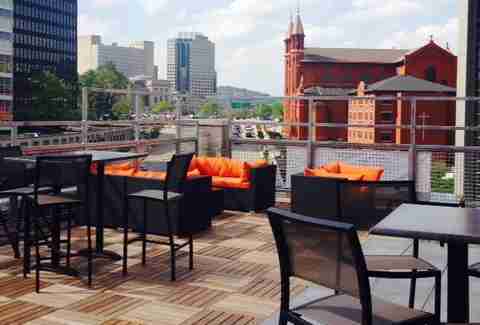 Uptown, aptly located in Pittsburgh’s Uptown neighborhood, is a rooftop lounge with sweeping skyline views. Uptown offers two dozen beers on tap, a dozen more in bottles, plus a long wine list and plenty of cocktails to cool down the summer days. During the summer, look out for an impressive list of seasonal wines and summertime acoustic music sessions called “Uptown Rocks!" 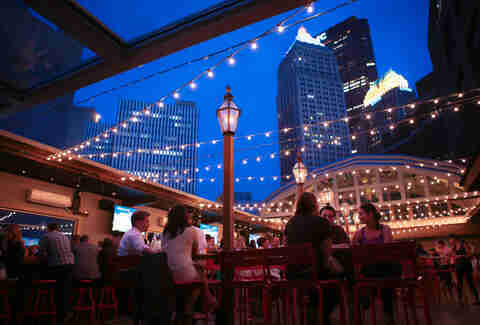 Perched high atop Hotel Monaco, Biergarten is the newest addition to Downtown’s outdoor drinking scene. This is not your typical hotel bar. The long list of European beers -- Belgians, saisons, dunkels -- and German bar snacks will keep you busy for several games of jumbo Jenga or giant Connect Four on the rooftop patio. A few menu highlights: order the sauerbraten for yourself, and order the pretzel sticks with beer cheese to share. Sure, part of the allure of The Church Brew Works is drinking more than communion wine inside what was once an actual church. 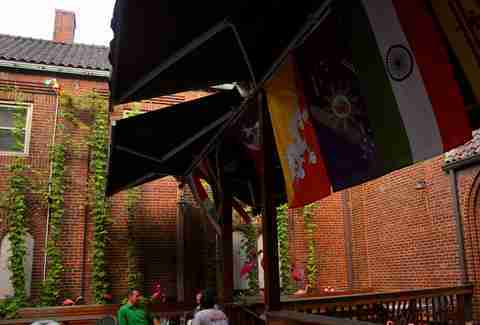 But the back deck -- called the Hop Garden -- is worth venturing away from the restaurant’s stained-glass windows and into the sunlight. Hop plants grow tall along the church’s facade, creating a fitting space to grab a beer, preferably the Church Brew Works Thunderhop IPA or, if you’re lucky enough to time it right, Oktoberfest. The home to Downtown’s finest Italian cuisine also boasts an extraordinary city view. 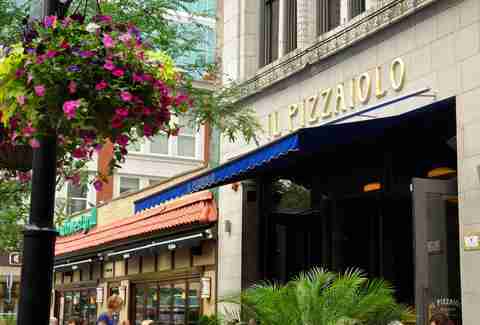 Located in the heart of the city, Il Pizzaiolo’s sidewalk tables offer a look at Market Square and PPG Place, Pittsburgh’s glass castle. Dozens of Italian reds are on the wine list, an ideal match with oven-fired pizza or homemade pasta. 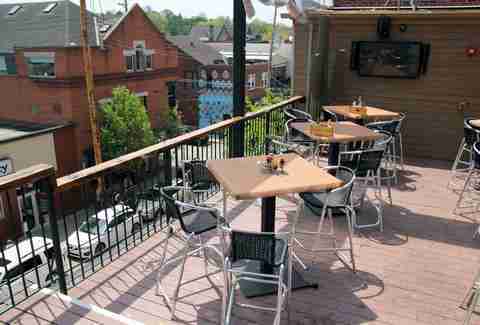 The giant rooftop deck at Steel Cactus in Shadyside is always a party. Burritos and tacos are on the menu, alongside margaritas and Coronas. The Yinzerita is a Steel Cactus delicacy: a margarita served with a bottle of beer balancing upside down in the glass. 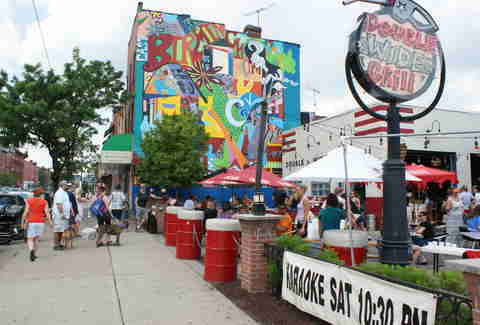 Located on South Side’s busy East Carson St, the patio at Double Wide Grill is a great spot for people-watching and dog-watching. Yes, there’s a special patio for dogs -- and even a menu for dogs. The restaurant specializes in both barbecue meats and vegan options, plus it has more than 40 craft beers on tap. Double Wide’s location was previously a gas station, and it pays homage to its history with a vintage garage vibe. With its city view, the front deck at Shiloh Grill is fun on any warm evening, but it’s a particular favorite on Tuesday, which is Bacon Night. Baskets of bacon are $1 at table seats and free at bar seats. The lengthy cocktail menu includes bar favorites, like the Sazerac and Gin Fizz, along with Shiloh Grill standbys, such as the frozen Cosmopolitan and the Neville Island iced tea. 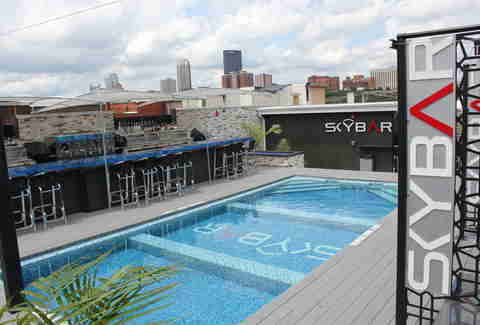 Skybar is like a Miami annex in Pittsburgh. During the afternoon, Skybar’s rooftop pool and lounge are open, with cabanas available for rent. During the evening, a transparent cover encloses the pool. Frozen cocktails, Champagne, and beer flow in the afternoon and all night. 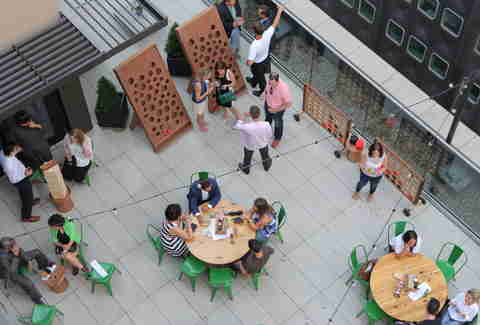 Skybar’s rooftop with a skyline view is home to special events throughout the summer, including DJ sessions, water gun battles, and yoga classes. 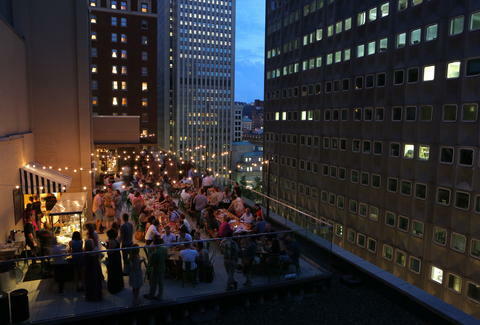 Il Tetto -- translation: The Roof -- is a rooftop bar in Downtown’s cultural district. It’s the top floor of Sienna Mercato, with restaurants on the first two floors. A clear retractable roof can quickly be closed to shield Il Tetto from Pittsburgh’s fickle rainstorms. More than 30 beers are on draft, along with an impressive wine list and classic cocktails. About a year old, Il Tetto has already become a popular spot, with lines of people awaiting the elevator to the roof. Rossilynne S. Culgan is a Pittsburgh native who has spent enough summer days at Redfin Blues to attest that the urge to buy a boat while dining there is real.